As we saw in other forms of image recognition and artificial recognition, the data that you train your system on is fundamental to everything else is does and learns. One of the more notable examples has been Google’s Deep Dream, which runs off the same type of neural network that powers Google’s Photos ability to identify images by their content. Deep Dream’s trippy effects come from giving it an initial image, then initiating a feedback loop, so that the network begins trying to recognize what it recognizes what it recognizes. The problem is that Deep Dream sees a lot of dogs. Everywhere dogs. “…every tool ever invented is a mixed blessing. How things will balance out is a matter of vigilance, moral courage, and the distribution of power. This is caused by Deep Dream’s trainer data set. The system’s programmers at Google started strong, using a data set from ImageNet, a database created by researchers at Stanford and Princeton who built a database of 14 million human-labeled images. As we’ve seen, the more data an AI / neural network is trained on, the better and more reliable the results. Also, large human-labelled (meaning: ‘probably correct’) data sets are few and far between. But the Google team didn’t use the whole database. Instead, they used a subset of the database – one that was released specifically for use in a contest. Now ImageNet already has a bias toward dogs, with a few hundred classes out of the total being dogs. 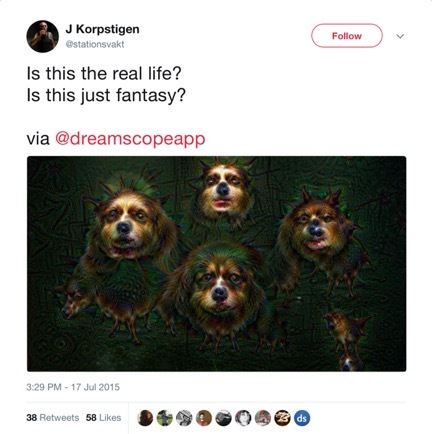 The subset the Google team chose was reportedly even more dog-heavy; Deep Dream sees dog faces everywhere because it was trained to see dog faces.